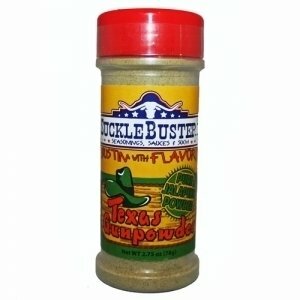 Pure ground jalapeno powder. Texas GunPowder is the best selling spicy seasoning in Texas! Texas GunPowder Original Seasoning is pure ground jalapeno peppers. We are very proud to offer the Original (green jalapenos) Texas GunPowder. This product has been popular since the 80's when it was first introduced in Mesquite Texas. There have been many folks copy this recipe but there is only one Original and this is it! Original recipe, pure ground green jalapeno powder. Texas gunpowder has a spicy-sweet flavor. Add to any food or use in place of black pepper, but watch out - IT'S HOT! Equal to 5,000 scoville units and like all SuckleBusters products - No Bad Stuff! Ingredients: Pure ground jalapeno powder. NO MSG. Naturally Gluten Free.